It’s no secret that I love sumo. 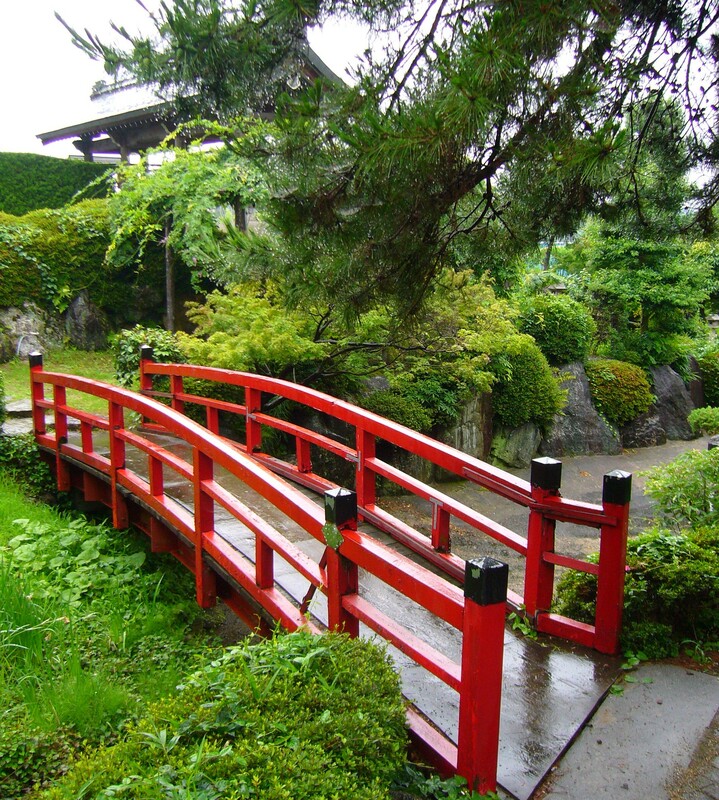 As with all things Japanese, the visual aspect of the whole thing is part of its appeal. 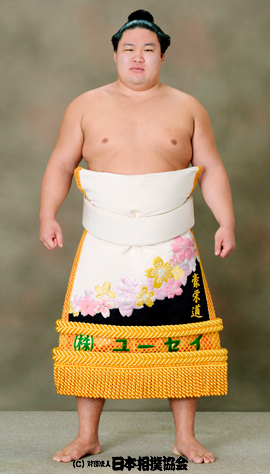 I would therefore like to dedicate this post to sumo attire. 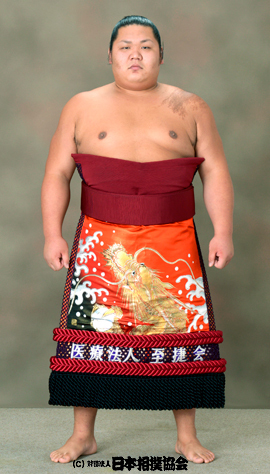 The wrestlers, or rikishi, are best known for their typical ring fighting outfit consisting of a colourful, silk, thick-waisted loincloth, called mawashi. But they also have a more elaborate ceremonial dress. 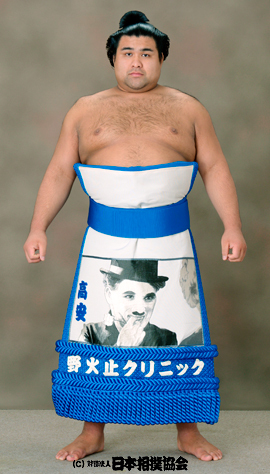 It consists of an ornate apron that is inserted into the mawashi. 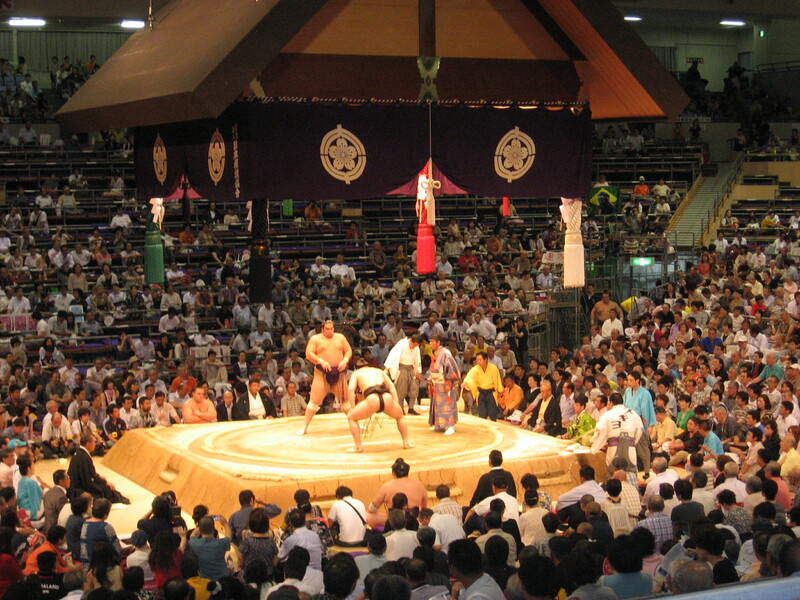 The apron, or keshō-mawashi, is worn at the ring entering ceremony. These gorgeous embroidered aprons are very expensive. They are usually paid for by a sponsor or one of the rikishi’s support groups. I had expected that all the aprons would depict traditional Japanese scenes, but that is not always the case. 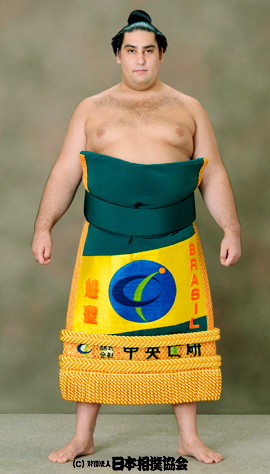 Sometimes the sponsor’s product will be featured and foreign rikishi sometimes wear a keshō-mawashi with their national flag. Some aprons even show funny pictures or scenes inspired by modern popular culture. Others refer to the wrestler’s ring name. The keshō-mawashi with a more ‘typical Japanese’ feel to them seemed the most difficult to find. Ironically it is Bulgarian wrestler Aoiyama who provides us with a traditional Japanese scene based on a woodblock print. Below is another keshō-mawashi based on a woodblock print by Hokusai, worn by Okinoumi. The choice of design might refer to his ring name, which means ‘the sea of Oki’. 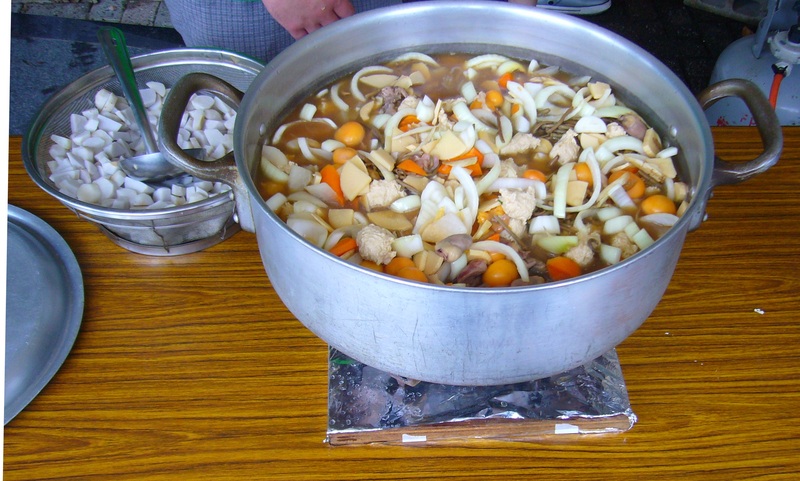 Oki-shotō or Oki islands is the island group where he was born. Also very Japanese but not quite what one would expect from a tough sumo wrestler: a design with cherry blossom, worn by Osaka-born rikishi Goeido. 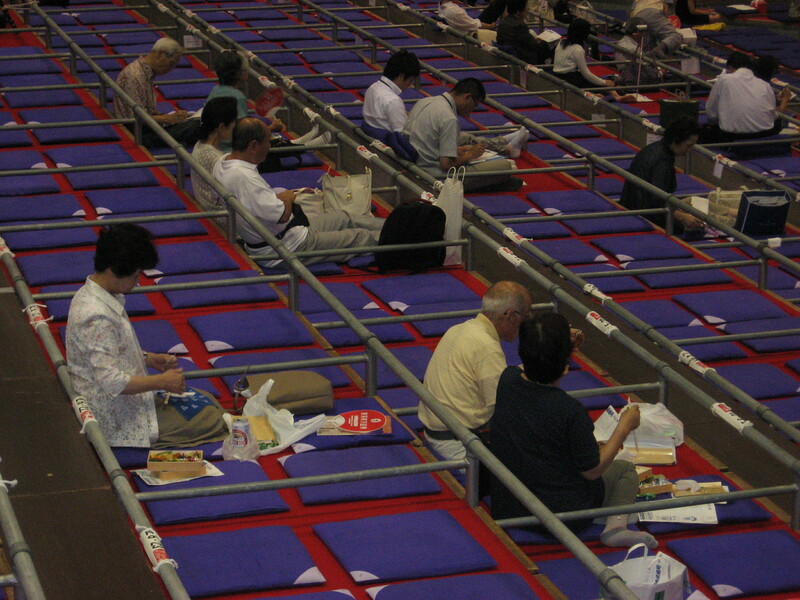 Some designs draw inspiration from a very different aspect of Japanese culture: manga. Have a look at this funny design worn by Ikioi. Estonian rikishi Baruto pokes fun at himself with a cute caricature. He also has an inception thing going on, where his image on the keshō-mawashi is wearing a keshō-mawashi with his image (it looks less confusing than it sounds). 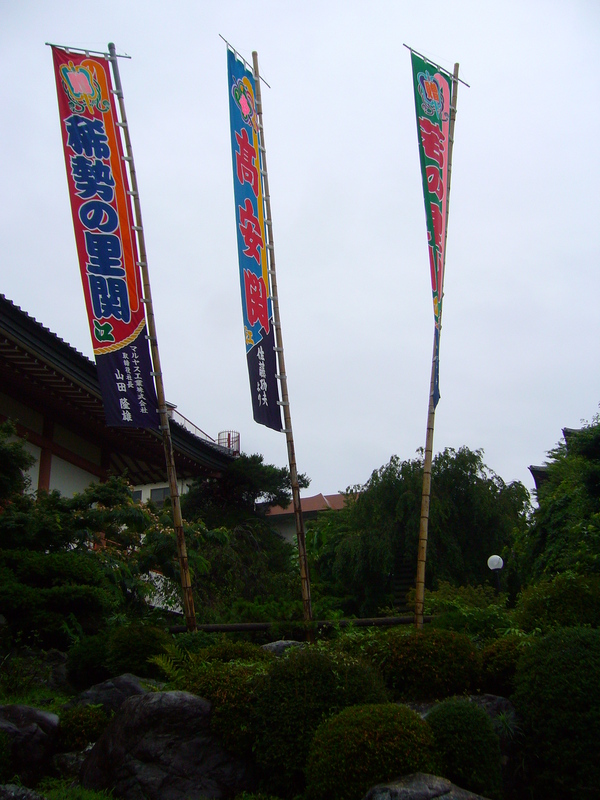 The most surprising reference to popular culture that I saw was on Takayasu’s keshō-mawashi. It features an image of Charlie Chaplin. I wonder what the story behind it is. I am terrible at reading kanji so the only thing I can make out on the apron is the word ‘clinic’. Some rikishi just have writing on their keshō-mawashi, like Yoshikaze. A Japanese mask on Toyonoshima’s apron. Is it perhaps a demon in a kabuki play? 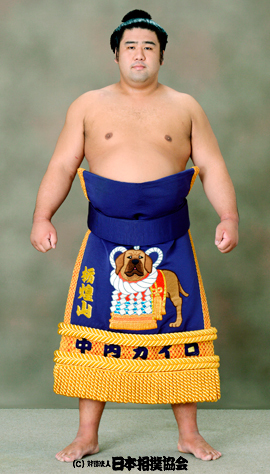 A personal favourite of mine: Tochiozan’s keshō-mawashi features a dog dressed as a yokozuna (sumo grand champion). My only question is, why?! 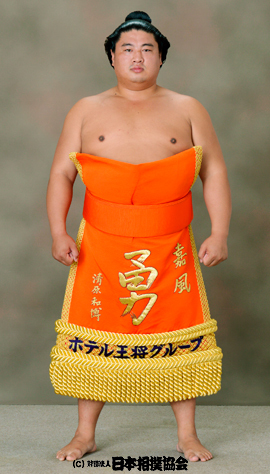 All images of rikishi in keshō-mawashi are from the Nihon Sumo Kyokai website. If you would like to have a look at some more keshō-mawashi, you can find them on this page by clicking on the wrestler’s names. 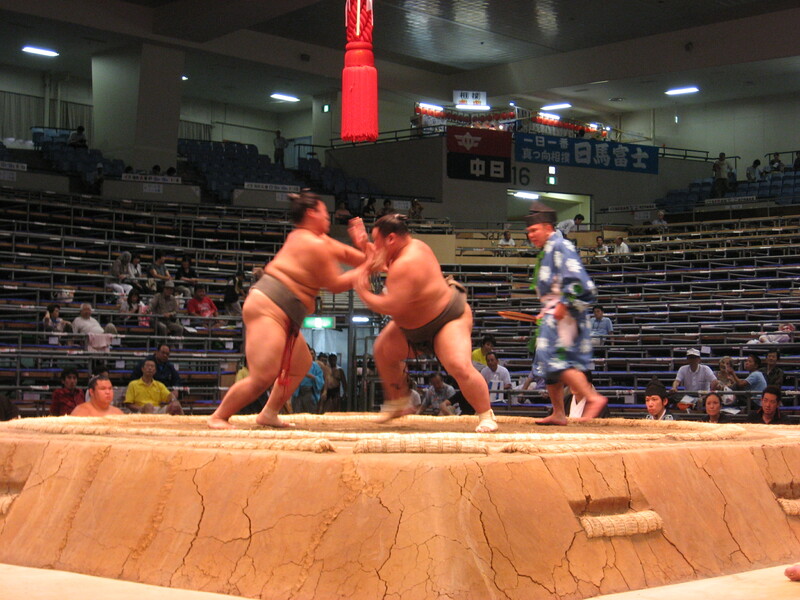 Every year in July one of the six Grand Sumo Tournaments is held in Nagoya. It goes without saying that we took advantage of the opportunity to experience a day of real-live sumo. 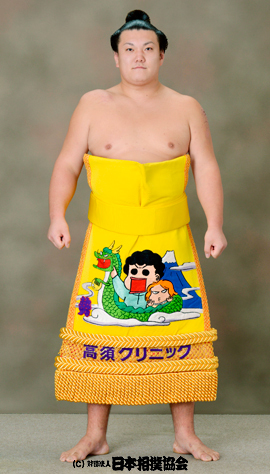 For those of you who live on another planet and have never heard of sumo: sumo is Japanese wrestling. Two very big guys try to push each other out of a ring, or try to make the other one touch the ground with a body part other than the soles of his feet. 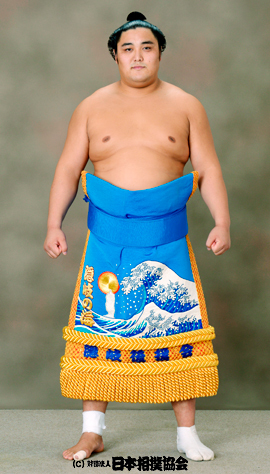 There are few things as Japanese as Sumo. You might think that an entire day of Sumo would be boring. It’s just two overweight guys pushing and shoving at each other, right? Nothing could be further from the truth. Sumo is exciting! 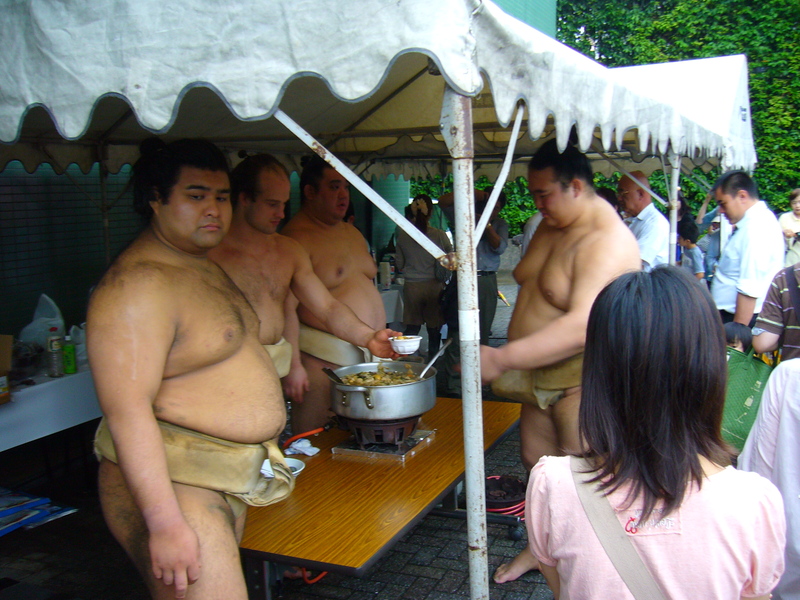 And those guys aren’t just fat, there’s a lot of muscle power and technique involved in sumo. We saw guys who were about to be tossed to the ground reverse the situation with a movement faster than the eye can see and toss their opponent instead. 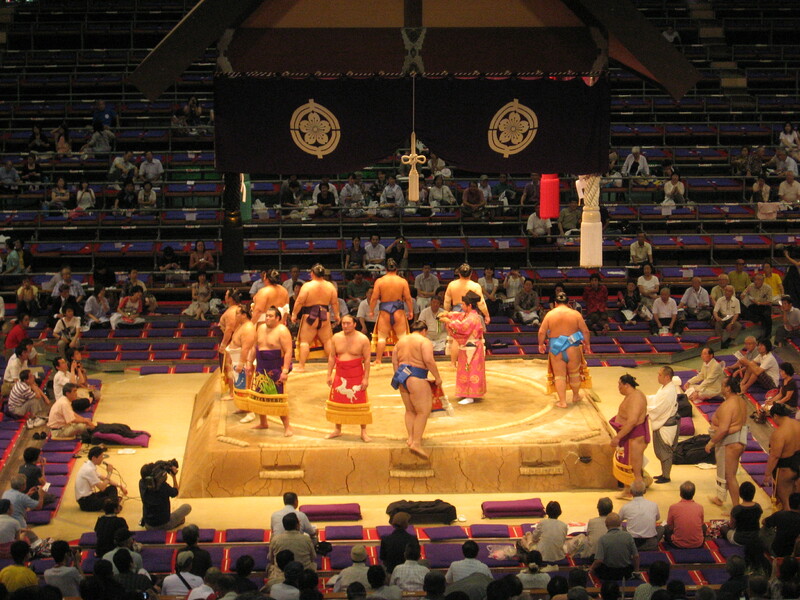 There’s a rhythm to sumo matches, which adds to the excitement. It’s all about building up tension, before each match and throughout the day. Lower ranking wrestlers perform early on in the day and each match involves consecutively higher ranking wrestlers. Each match starts with a guy with a fan singing out the names of the wrestlers. An eerie sound. 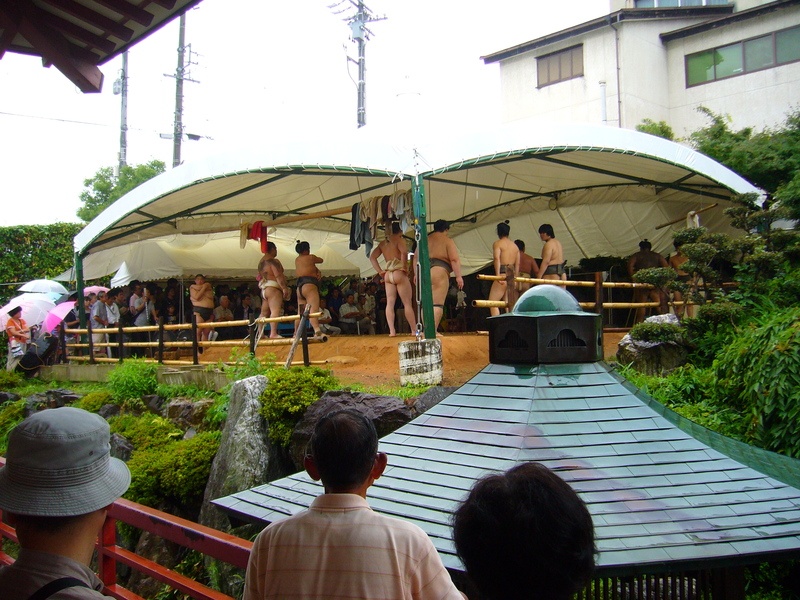 Then the wrestlers step into the ring and carry out various ceremonial gestures. They face each other and squat, then get up again. This can go on for up to four minutes while they test each other’s nerve (and the audience’s nerve). They start when both wrestlers have both fists touching the ground at the same time. The fight is often over in mere seconds. A winner is declared, the wrestlers leave the ring and the chanting starts again. The final matches of the day are preceded by a colourful ring entering ceremony. 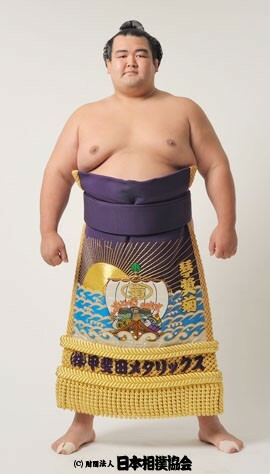 The highest ranking wrestler (yokozuna) gets his own special ceremony. It’s a tremendous honour to be made yokozuna. To give you an idea: in the past three hundred years there have been only sixty-nine yokozuna. Currently there is only one, and he is a foreigner. 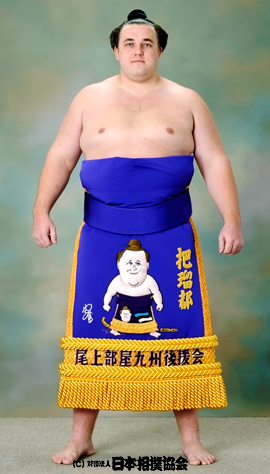 Actually the second highest category of sumo wrestlers also consist entirely out of foreigners. As sumo is so closely connected with Japanese identity, I was wondering how Japanese people feel about all those foreign wrestlers. A little researched showed that in 2002, the Japan Sumo Association installed a ‘one foreigner per stable (sumo training establishment)’ rule. So I guess in any case the JSA might be a little touchy about it. But the public didn’t seem to mind. Many foreign athletes received a lot of encouragement. So maybe in the end all that matters to the general public is good sumo? If you get the cheap seats all the way at the top of the venue, bring a sweater. The air-conditioning was set to ‘chilling’ and we were sitting right underneath it. If you are willing to invest in a seat closer to stage, be forewarned that the little boxes in the picture below are meant to hold four (!) people.